After all the excitement of recent weeks, it’s time to put the emphasis back on the gansey – which is, after all (theoretically), the point of the exercise. As I’d consciously made the armhole on this gansey narrower than on others I have knit (c. 8.5 inches, whereas they usually end up 9-10 inches, despite my best intentions), I had to be careful not to decrease it too much as I worked my way down the sleeve. So I kept a careful count, and when I reached 98 stitches in the round I stopped decreasing; the last 2.25 inches to the cuff is knit straight, with no decrease. (One neat, but purely coincidental, effect of all this, has been the reduction of the last 2 tree panels on either side of the seam stitch to 2 half-panels – so, they make one complete tree separated by a seam stitch. Which looks rather cool, and I can pretend in future that it was a deliberate part of the pattern.) There is just over an inch of plain knitting before the cuff, as usual. I reduced for the cuff by 10%, which is the usual amount the books recommend – as I had 98 stitches I reduced them by 10 to leave me with 88 including the seam stitch (which I incorporated into the final “purl 2″ of the knit 2/purl 2 ribbing). The final number has to be divisible by 4, of course. Then I just kept knitting the ribbing for 6 inches, leaving me with a nice long tube, which can then be folded over on itself for a 3” adjustable cuff. 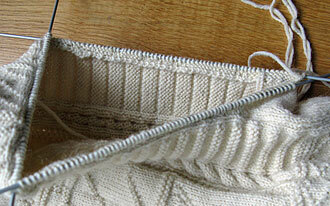 The final cast off row, like the collar, is cast off in the same ribbing pattern (knit 2/purl 2) so it lies flat. Finally – apart from stretching my mind trying to remember what I’d done on the other sleeve (the “utmost gaping of brain”, as Ted Hughes so eloquently put it in one of his Crow poems) – I’ve decided what I want to do when I grow up. I’m going to be a consultant, because – like lawyers – there are never enough consultants in this world. I’m going into partnership with a very good friend of mine, also an archivist, as cultural heritage and information management specialists. It’s a long-time dream of mine, but I’ve never quite had the courage to go for it ’til now – and I really think it’s now or never. It’s not without its risks in the current climate, however. Do you remember the old quip about the change of ministers of religion in the English Civil War (“new presbyter is but old priest writ large)?” Well, there’s a real risk that “new information consultant is but old unemployed layabout with delusions of grandeur”! Well, I can’t call myself an information management person, given the state of my record-keeping and books, but since I tend to give unasked-for advice, I might try calling myself a consultant. Best of luck with the new venture! Remember, no guts, no glory! Well, I have to take out professional indemnity insurance, in case anyone sues me for taking my advice, so be careful! And thanks for the good wishes. Faint heart ne’er won fair maid, etc. Given your stated reasons for sporting a ball cap, you may well not be speaking to me any longer because of my comments about said item of apparel, as worn by the American male over 40. Since I made those remarks, it has occurred to me that perhaps the current ubiquity of the ball cap on both men and women, regardless of age or chevelure, is partially attributable to the popular TV series NCIS??? One which I have only just discovered, because we have been without network television for more than a decade. I don’t think it’s entirely the coat that is affecting Gus’s mood in the picture – there may have been provocation! 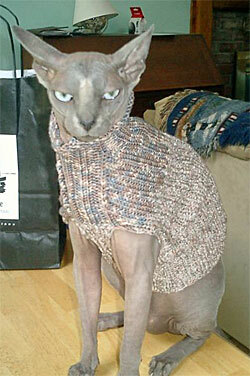 And maybe he’s just not a cat who likes having his picture taken, something I think we can all relate to. When I’m forced to pose for a photo that’s the expression I have in my mind. No, you’re quite right – I have affected baseball caps because my hair is falling like the autumn leaves, and sunburn comes into the equation. In the winter months I stick to the good old traditional flat cap, and only with difficulty resist the temptation to get a shepherd’s crook and a sheep dog and walk around calling, “Come by!” at Edinburgh’s many tourists. But baseball caps are lighter, offer better air circulation, and the peaks shield the eyes better from the sun (and rain! ), thus making them a better bet for summer wear, even if they do make me look a bit of a twit. And I’m not offended by people pointing out I’m going bald – I mean, it’s a fact. Gus is a guy who never looks happy, so the look you see in the pictures is Happy Gus. 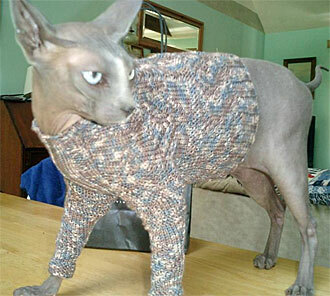 He is rather droll, and enjoys wearing clothes (he has other togs;fleeces). Unless it is quite warm he needs to wear something if he is to be active. Otherwise he just curls up under a fleece blanket all day. Gail – thanks for clarifying that this is actually a happy Gus. Gordon – re: ball caps and looking as cool as Mark Harmon wearing one. I’m sure there are many happy delusional souls who sport one for just that reason. Reality is overrated. Most of us would prefer to subscribe to a good fantasy. I think there should be a caption under the second picture of Gus that says: “I’m gonna get back at you! just you wait”! On the other hand, lovely Gus & Gordon ganseys! Well, I think with that attitude Gus should have “love” and “hate” tattooed on his knuckles. I suspect when there’s no one around he finds a mirror and just stares into it, muttering, “You lookin’ at me?” But he has got the fanciest cat jumper I’ve ever seen. Maybe we should market them? Yes, the flat cap is the gentleman’s choice. Alas, I only occasionally behave like a gentleman, hence the need for another type of cap!